What Does Radiation Do to Living Things? One of the initial Atomic Bomb Casualty Commission studies conducted at Nagasaki in 1950 was the outcome of the pregnancy in mothers exposed to the radiation from the atomic bomb. Note the abnormally shaped small head—microcephaly—accompanied by mental retardation. Microcephaly due to in-utero exposure (seven week gestation in estimate). Exposure distance of 1.2km from Nagasaki hypocenter. 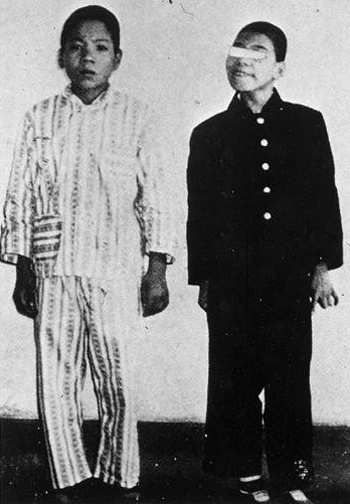 Delayed grown in whole body and microcephaly observed (right). Fifteen years and eight months old. Died March 1962. Twelve year old normal child (left). Outcome of pregnancies of mothers who were within 2,000 metres of the hypocenter was finally initiated and concluded just prior to my return to the U.S. In mothers who demonstrated signs of radiation sickness compared to mothers who did not develop such findings there was a significant increase in perinatal loss and some of their children had an abnormally shaped small head who were mentally retarded. The incidence of miscarriage, stillbirth and death during infancy was 43 percent, seven times the incidence in a control group who were considered to have received no radiation. In an interdisciplinary laboratory investigation initiated at UCLA following my return, the effect of radiation alone revealed the marked vulnerability of the developing brain. The brain lesions and neurological abnormalities were greater in the younger animals and the severity was a function of the radiation dose.